"If I should die tomorrow, I will have no regrets. I did what I wanted to do. You can't expect more from life." His power was wrought from the taste of his own blood, shaped with his bullet train physique and thrust onto the world with lightning- and razorblade-fists. Bruce Lee was more than just an action movie star. He was a teacher, a philosopher, an entrepreneur, a martial artist who breathed in fire and spit out legend. This figure is part of Art Asylum's "The Dragon Lives" line. Art Asylum, rather than chasing the hot new movie or music license (though they have done both - well), tracks down the pop culture on which they were raised; from classic '70s rocker jack-in-the-boxes to little-known '60s cartoons, AA's tastes ran to the eclectic. Their newest line, "The Dragon Lives," certainly fits that mold. These aren't the first Bruce Lee figures ever made, but they are easily the best; Play Along Toys' Enter the Dragon line was okay, but nothing to write reviews about. Well, nothing but bad reviews, at least: their sculpts were terrible, they had almost no articulation, and they were poorly presented. Bah! 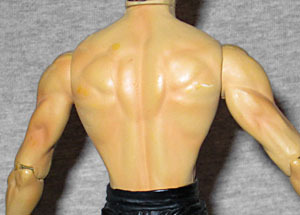 But now, perhaps due to their nebulous and vaguely defined connection to the white-washed world of Play Along, Art Asylum has secured the rights to produce figures of Lee, though apparently not of his films - while each of the figures is recognizably from a specific movie, there is no direct mention of that anywhere on the packaging. 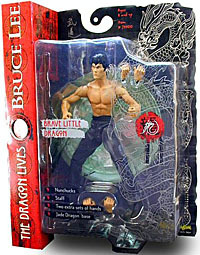 This figure, Brave Little Dragon, is based on the classic Enter the Dragon, finding Bruce in the familiar black pants and bare chest (though without the scratches). They've got the thin, wiry muscles down pat, and it really looks as if you're seeing the bones and tendons beneath his skin. 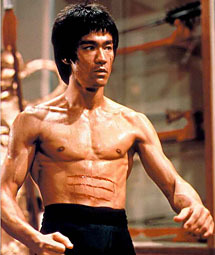 His right foot is sculpted so that he can stand with his heel raised, simulating the stance Bruce developed to accommodate his unique shuffling movements. The packaging for this line is well-designed; red and black with white printing, there is a detailed Chinese dragon running up the right side of the blister card. The rear of the packaging has pictures of the entire line, production team credits, plus a window through which you can view the included jade dragon base's ornate details. The figure comes with plenty of accessories - nunchucks, a staff, and two extra sets of hands (four designed to hold weapons and two for fighting). There are two different heads available with this figure - one calm and determined, the other screaming in anger. They were shipped in equal numbers (or equal enough that the difference is negligible), so you can make your choice on personal preference rather than which one might be "the variant." I picked up the calm face, simply because it looked more like the badass I envisioned. The Brave Little Dragon is articulated at the neck, shoulders, elbows, wrists, waist, hips, knees, and ankles. The hips are interesting - while his right leg is your standard forward and backward swivel, his left leg moves laterally. While this does allow you to put him in a bit of a kicking pose, I think balljoints would have worked better. Perhaps I've been spoiled by ToyBiz's offerings of late, but I would have liked Bruce to have more articulation; perhaps some more twists to give him a wider range of martial arts poses. His articulation is still better than average, so I won't be counting him down in that department. 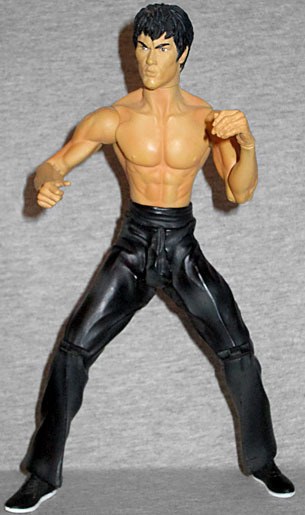 Standing 7" tall from his white-soled shoes to his tousled sculpted hair, this Bruce Lee figure can overcome all challengers. The man changed the face of martial arts forever, as well as the Western world's perception of the Orient. 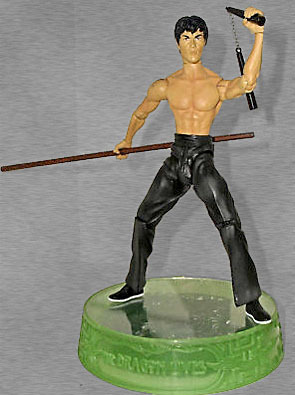 At last, there is a figure worthy of recognizing Bruce Lee.